Leinster A's up and coming players. In the Leinster squad at the start of the year, a number of players have drifted in and out of the Leinster 23 man squad, replacing another or either being given a chance. Some of the players were given the opportunities to have a little experience under their belt, some really did experience competitive professional rugby and loved it, others not so much. One player that really did make an impact on their chance was Brendan Macken. He played exceptionally in his matches against Newport Dragons and the Scarlets (starting both matches). In his match against the Scarlets he intercepted a pass and scored a try, effectively sealing the win with a fifth try for the side. 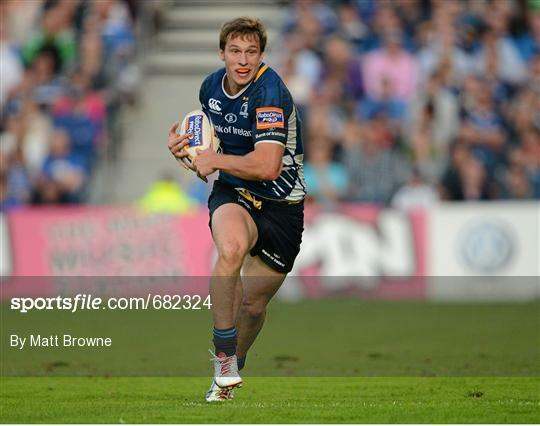 He had a solid performance giving Joe Schmidt a good impression for the future. He will add a lot to the provincial side and Ireland when given the chance. He has however been on the scene for a little while, having his first appearance against Glasgow Warriors in 2010. This was short lived as he then became a solid player with the A side. He did however make several appearances with the Irish u20's (13 in total). He is only young being only 21, he still has time. In my opinion he can makes his way through the ranks pretty quickly. His first objective, being to make the 23 man squad on the Leinster squad, and actually having regular appearances to their matches as a sub. Occasionally playing for the Irish wolfhounds, will add another bit to his career, in effort to make the starting Irish squad in the next 5 or so years. This said, given that Gordon Darcy and Brian O'Driscoll retire he should make the Irish squad for the 2019 world cup.